Living in a home that draws water from a well may lead to hardness, manganese, iron, and even unbalanced pH levels. Traditionally, if you were experiencing these issues you would purchase three different systems to remedy them. WaterCare® has the perfect answer. TotalCare® is unlike any other water conditioner. Using Crystal-Right™, a media exclusive to WaterCare® products, TotalCare® conditioners can resolve hard water minerals, iron, manganese, and acidity. 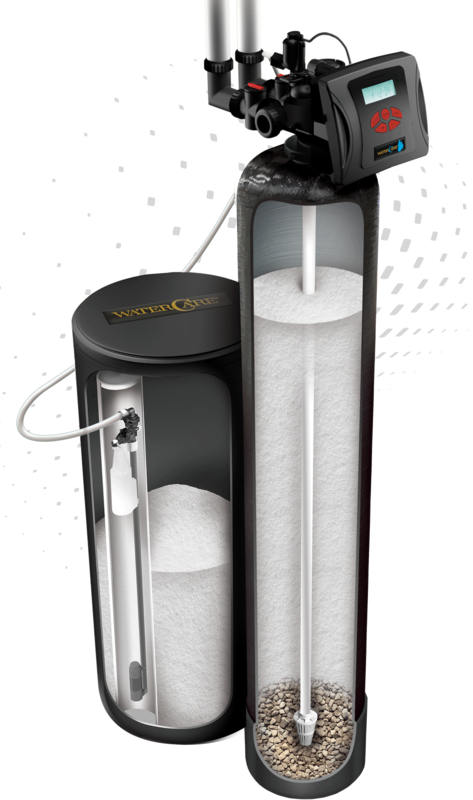 With our patented, Chlorine Generator, which provides automatic cleaning cycles, your worry-free conditioning process is complete! TotalCare® electronics include the option to enable Wripli®, our convenient WiFi technology. Wripli® allows homeowners to manage water usage, receive notifications, and more from their device. The advanced Crystal-Right™ media and Chlorine Generator are also available in our twin tank unit, offering the same efficiency for the most demanding homes. Typical single tank units cannot provide treated water during their regeneration cycles. Having a twin tank system ensures that your home will always have conditioned water on demand. The TotalCare® Twin System also includes the option to enable Wripli®, our convenient WiFi technology. Wripli® brings homeowners the convenience of managing water usage, monitoring system alerts, and more in the palm of their hand. Click a button below to view animations on how TotalCare® Series works to treat the water in your home. See the water conditioning system in action. 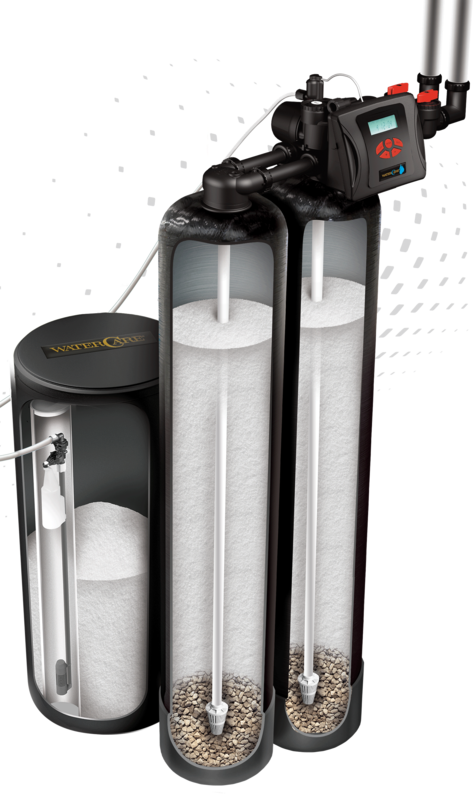 Talk to a WaterCare dealer about TotalCare® Series water treatment systems today. This is the normal operating position of the conditioner. In this stage or position, untreated water flows through the inlet side of the control valve and down through and across the media. It is at this moment the undesirable minerals (calcium, magnesium, iron, manganese, etc.) are removed from the water. In some models, the pH of the water can be increased at the same time. Backwash is a step in the regeneration process where the media in the tank is physically lifted up, spun around and agitated under pressure. It is cleaned of any particles such as dirt, clay, and precipitated iron which has been filtered out during normal use of the system. The backwash water containing the undesirable particles flow harmlessly to drain. This cycle is the rejuvenating or recharging cycle in the regeneration process. Brine is drawn out of the salt tank and passes through the patented chlorine generator in route to the system's media. While passing through the generator it comes in contact with a small amount of electrical current which in turn creates free chlorine from the chlorides in the brine. As the chlorinated brine solution flows through the media it disinfects the tank and recharges the media. Most of the chlorine is consumed in the disinfection process. Any leftover chlorine and brine solution is removed during the system's rinse cycle. This is the final step in the regeneration process. It ensures that any remaining salt and residual chlorine has been rinsed from the unit. When the cycle is completed, the unit returns to the service position to provide quality conditioned water.